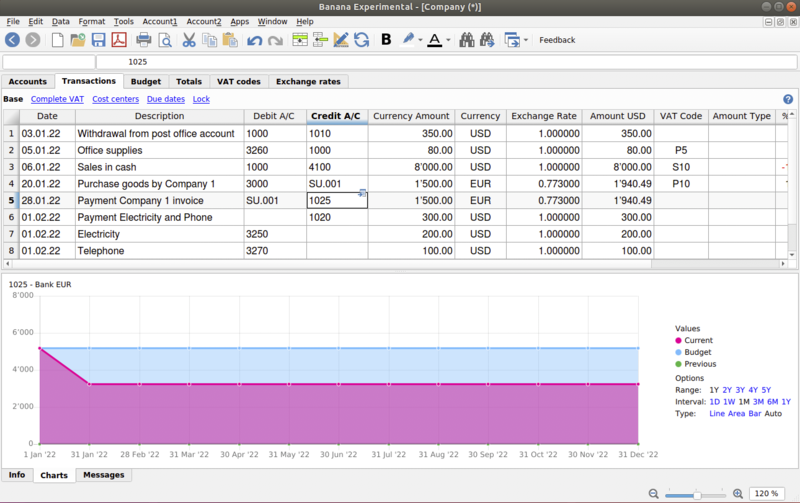 The Linux version of Banana Accounting 9 is a native software for Linux, developped thanks to the Qt libraries. The software is spreadsheet inspired, and then perfected for a professional accounting use. Files created with Banana Accounting 9 for Linux are completely interchangeable with Banana 8 for Mac, Windows and Android. Banana Accounting for Linux largely uses open source libraries. Thanks to this, Banana can offer a high-quality multifunctional product at an affordable price. Banana.ch contributes to the constant improvement of the libraries, and is committed to help increase the use of Linux, by making the program available for purchase for Linux. The function "Send file via email ..." doesn't work when using Thunderbird as default e-mail program. In these cases, open the folder that contains the accounting file and attach the file manually. On openSUSE Tumbleweed, TrueType and Adobe fonts are not printed correctly. Please report to us any problem you encounter with your distribution, so that we can publish it on our webpage. Banana Accounting 9 needs to download Templates, news and Apps from the internet. To accomplish this task, the library OpenSSL version 1.0 must be installed on the Operative System. On some Linux distributions like openSUSE, the SSL version provided is the 1.1, which is not compatible.